Manual Therapy: Hands on approach to physical therapy that involves correcting joint and soft tissue limitations. Geriatrics: Addresses the natural changes that affect our body as we age as well as injury. May include arthritis, degenerative spinal disorders, joint replacements, balance and posture, osteoporosis. Pediatrics: Orthopedic as well as neurological deficits and developmental delays. May include autism, spina bifida, muscular dystrophy, motor coordination, or even difficulty focusing in school. Women’s Health: Address all areas of health issues specific to women. May include pre and post natal pain and disability as well as bladder difficulties. 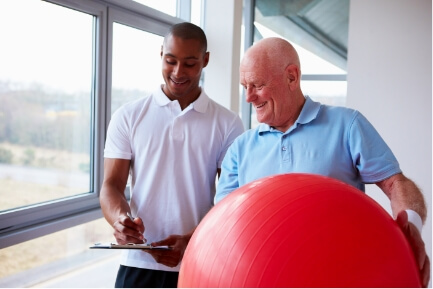 Sports Rehab: Injury prevention and rehabilitation following injury or surgical intervention. May include ACL rehab or improving a golf swing. Pain (Chronic and Acute): Goal of decreasing pain and increasing mobility and function. May include pre/post surgery, MVA, or unknown cause. Vestibular and Balance Rehab: Help to maintain the greatest amount of function possible with assistive device and education. May include dizziness, coordination, balance, and falls related to BPPV, vertigo, Parkinson’s, general weakness, stroke. Wellness and Fitness: General health and exercise programs to either prevent injury, recover from injury, or maintain health status following injury. Orthopedics: Recovery from surgery, conservative treatment to prevent surgery, joint, spine, or soft tissue related injury.